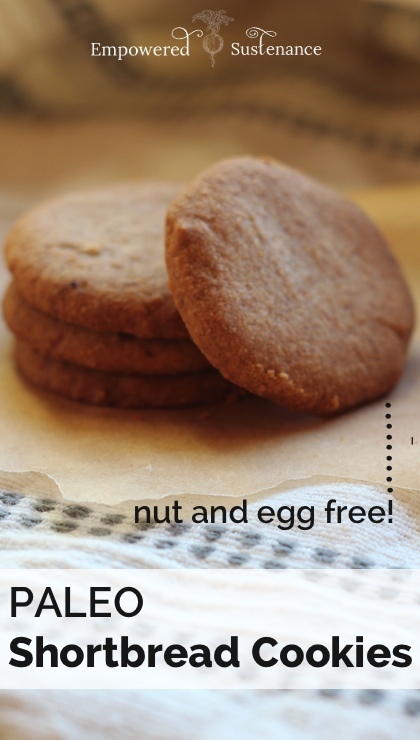 Arrowroot is not legal with the SCD diet protocol, so I used almond flour instead. Nice idea, but they are so dry they are a choking hazard. For realzzz. Lauren, I made a batch of these cookies today. Only problem, I could not wait for them to cool all the way before biting into one. Nonetheless, they were not crumbly at all, even tasted better than they look in the picture. And mine are not dry, as some have experienced. Perhaps my flour-to-oil ratio was spot-on. Those who are dismissing this recipe are missing out on one of the finer treats in the Paleo world. They should try again, making sure the flour is not compacted or, alternatively, use a little more oil. 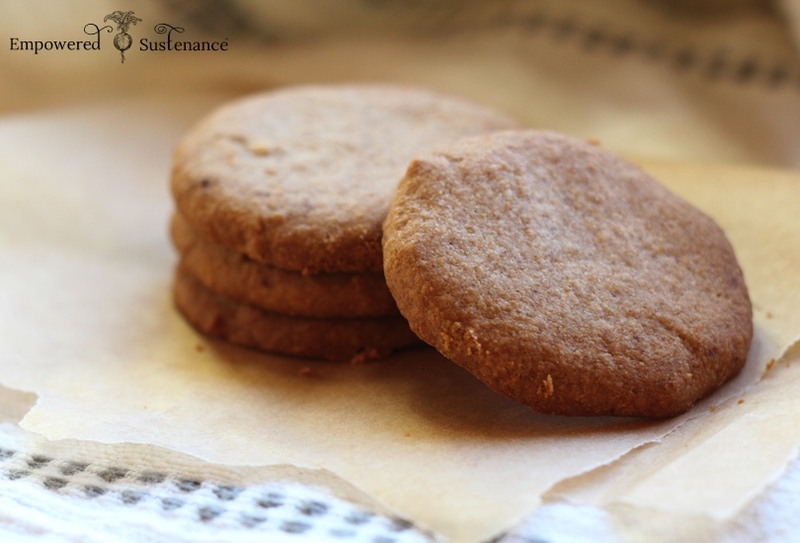 Where else can you get such a delicious, grain-free shortbread cookie? Thank you. Made these after the kids went to bed tonight. Spectacular!! Halfway through, I realized these would make awesome thumbprint cookies. So I made my balls a little larger, formed a small crater, and put in cherry preserves. I was right. They are amazing! The final product IS dry, but that is what herbal tea is for. They are shortbread, after all! These are perfect, and hit the spot! I made 16 tiny cookies and baked them for 5 minutes. I was testing these out, to see if I could make paleo pineapple tarts for Chinese new year. Probably not the right recipe for that, but still delicious. Maybe in tiny tart pans or a mini muffin tin……oooh, that could work! I MADE THEM AND THEY’RE AMAZING! Sorry for writing in caps, just wanted to get attention 🙂 I followed this to a tee, and when I finished with the mixture it was extremely crumbly. Needless to say I was incredibly doubtful this was going to work (I may have even complained to my other half, a very talented cook, and put it down to my own abilities). He encouraged me to keep going. I did, although I put in two extra tablespoons of coconut oil to be safe. They turned out *amazing*. I have non-paleo eaters who really approve of them (one offered to buy a batch if I made more), and it’s great with my herbal tea. My advice: trust the recipe, and just keep going to the end. To the lovely Lauren, thank you 🙂 Also, there’s a small typo where it tells you to “cook” the biscuits for 15mins (after the initial 6 – 8mins), where I’m assuming it should be “cool”. For people that shouldn’t be in the kitchen (like myself), this can affect the outcome haha. I thought they were pretty good. They do need to freeze for a bit. I like the dry, crumbly feel…that’s what I expect from shortbread. Hi, I just came across your blog, and I am reading your book about nutrition and PMS with curiosity. I am wondering if you have a similar book about insomnia and energy? I understand that the principles are somewhat the same, when it comes to nutrition and lifestyle choices, but I would love to know if there is something to add when it comes to sleep. I started sleeping poorly after working overnight shifts, and it never returned to my “normal” pattern of regular sleep. I functioned many years with little sleep, but after about 8 years with lots of work etc, I had no energy left. And, even though I use meds now that help me sleep, I am still totally out of energy, 3 years after I started sleeping. When I read about how an overactive adrenal glad may have caused adrenal fatigue, that totally makes sense. So, I will do what I can to make it better. Any other tips on my way? Well, I tried these. Unlike everyone else, my cookies spread out waaaay wide and were super oily. They came out more like “lace” (very thin with lots of holes, almost burnt they’re so thin) cookies, or almost like the top of crème brule’e. The flavor was good, but my texture’s interesting. I don’t like to throw food away so I didn’t, maybe I can figure where to use them bc it seemed really sweet, tho I did do them in the morning and they were pretty much my breakfast until I felt weird and had some carrots and hummus. I used homemade coconut oil, which is always not enough to absorb the moisture, but have yet to figure out the commercial flour to homemade flour ratio sub. Interesting recipe, though. I love these! The key is to freeze them first. I also put cinnamon on top and they are so good! Thanks for all the great tips and recipes!